Keeping a regularly updated and detailed diary of your life, while great for preserving your memories and life experiences, requires a certain level of discipline that isn’t always easy to maintain. Fortunately, for those of us who can’t find the time to write about our day-to-day lives, Synium Software has released Chronories, a program that streamlines and automates daily entries for you. Think about the most mundane aspects of keeping a diligently updated diary: writing about the weather, your mood, your work, people you chatted with, music you listened to, and so on. Chronories can do all of this for you. Running in the background on your Mac, Chronories automatically keeps a daily log of your local weather, your e-mail, chat, and Web surfing history, how long you ran applications, major news headlines, and even the music you listen to. It also lets you enter your daily mood and take a screenshot or webcam snapshot with just one click. Of course it also provides you with an actual spot for writing, but with all of the bases Chronories covers, you may have a lot less to write about. Chronories puts an icon on your menu bar that gives you instant access to one-click features like entering today’s mood, taking a screenshot or snapshot of yourself, and jumping straight to your diary page. If you don’t feel like entering anything for the day, Chronories’s background service will continue to write about the basics of your daily life for you. It can even run analytics for your life, letting you look at graphical summaries of last month’s weather and how it affected your mood, or who you’ve been corresponding with the most, for example. 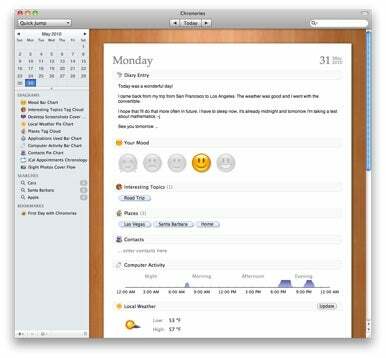 Chronories, which runs on Mac OS X 10.5 or later, is available from now until June 30 at an introductory price of $19, after which it will be priced at $29.